Australian Capital Territory (ACT) – our nation’s capital. Covering a total area of 7.69 million square kilometres, mainland Australia is the world’s largest island – but smallest continent. In distance, the continent stretches about 3700 kilometres from north to south and 4000 kilometres from east to west, making it the sixth-largest nation after Russia, Canada, China, the United States and Brazil. The majority of Australia experiences temperate weather for most of the year. The northern states of Australia are typically warm all the time, with the southern states experiencing cool winters but rarely sub-zero temperatures. 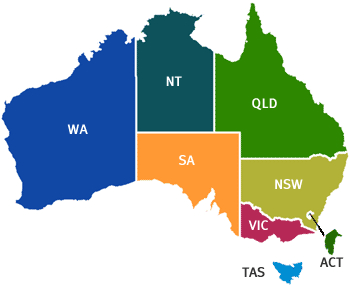 Australia has three levels of government – the federal Australian Government, the governments of the six states and two territories, and around 700 local government authorities. Australia has been a nation with a single national government since 1 January 1901. Although it is divided into states and territories which have their own state governments, all these states are united as one nation. Australia follows a Westminster system of government and law inherited from the British who originally colonised the country.